Are you were searching to buy a brand new luxurious car? If you are, then it’s time to stop that. Because today I’m going to show you the top 5 luxury cars for men and you’ll probably fall in love with at least one. These top luxury cars are the ultimate transportation form, built to make your blood rush trough your veins and to offer you the most luxurious drive you ever had. With sensual design and shapes, top notch interiors and powerful engines, these top 5 luxury cars for men will rock your world upside down and maybe sideways too. Don’t be an average Joe and settle for a boring car, pick one that you’ll never get tired of. 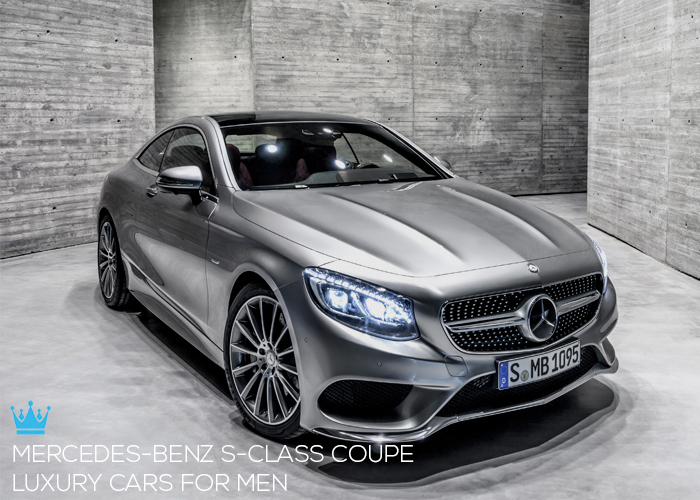 So are you ready for the Top 5 Luxury Cars For Men? Seatbelts on and here we go! With a new more muscular appearance, the new S-Class Coupe is the first production car to feature a an advanced tilt function. The new luxury car from Mercedes is announced to go on sale in November, so keep an eye on it, because if you see yourself in this amazing car, maybe you’ll be one of the proud owners of one. The car looks insane, and the interior is absolutely gorgeous. It features frameless doors, a coupe-specific three-spoke flat-bottomed steering wheel and a superb dashboard. If you’re interested in more about this amazing car you can read a full article on it here.